Actually, it's not so easy to get a selfie with a new bee package. iPhone's don't work so well wearing leather bee gloves. But the bees did pose well I thought. They are very sweet bees. 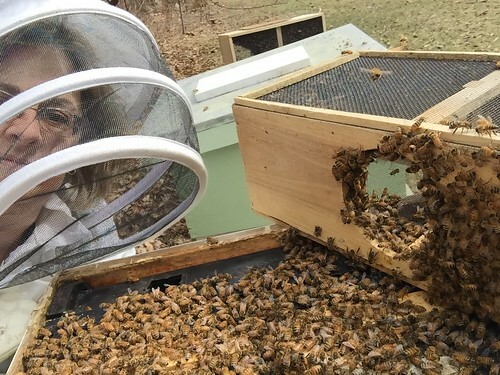 Once they take up residence and start protecting their hive, I won't do selfies with them. Ah look at all the great girls. Wishing you better luck this year! I just installed three bee packages in my hives from dead-outs this winter. I got my bees from nebees this year but usually get them from crystal bee supply. Did you get your bees from crystal bee supply? I got mine from NE bees. I always get them there. I find Rick at NE bees very informative and if you have a need for a queen he's a good source from March to August. Vin and Jan at Crystal bee in Peabody, MA is another option I learned at the Topsfield Bee Keeping class. I've been getting bees from them since 2011 but this year I couldn't justify the price increase so went to NE bees.